"Come along with me, and the butterflies and bees..."
note From top from bottom: Lumpy Space Princess, Lady Rainicorn, Gunter, Marceline, Ice King, Princess Bubblegum, Earl of Lemongrab, Flame Princess, Finn, The Snail, BMO, Peppermint Butler, Jake, Tree Trunks. The fun will never end, it's Adventure Time!" What time is it? Describe Adventure Time! Adventure Timenote also known as Adventure Time with Finn and Jake during the show's first season began life as a seven-minute short created by Pendleton Ward, produced to be a part of Random! Cartoons on Nickelodeon. Originally meant to premiere in Fall 2007, the animated variety show was delayed from public airing until December 2008. However, the short itself was shown solo on Nicktoons Network in early 2007, at which point it quickly went viral on the Internet. Why? Because it's really frickin' weird, that's why. Both the original short and subsequent series feature the adventures of two best friends: Jake the Dog and Finn the Human (Pen the Human in the original short). Their adventures are nonsensical, crazy, and bear more resemblance to a group of kids playing with action figures, or a particularly baked round of Dungeons & Dragons, than a coherent plot... which is probably why it's so dang fun. Much like Homestar Runner, it's sort of a cross between a children's show and a parody of a children's show, with these elements still being very much present even after the show took a turn for the darker. Nickelodeon passed on making it into a series twice, but rival Cartoon Network saw its potential and ordered two full seasons off the bat. A preview aired on March 11, 2010, with the show formally beginning its run on April 5th, to the delight of 2.5 million viewers. Thanks to the massive success of the series, the show has spawned an increasing range of spin-offs in other media, details of which can be found at the Franchise page. The mathematical production blog, which also features art from fans, is located here. The algebraic wiki is here. On October 2nd, 2014, Pendleton Ward announced to Rolling Stone that he had quietly stepped down from his position as showrunner during its fifth season due to burnout, though he remained as a storyboard artist, script writer, and voice actor. Adam Muto, who had been involved with Adventure Time since the original pilot, would serve the role of showrunner for the remainder of the series. On September 29, 2016, after months of erratic airings, Cartoon Network announced on Twitter that the show would end in 2018; which it did on September 3, 2018, with the hour-long series finale "Come Along With Me" airing after an all-day marathon of the show's most popular episodes. 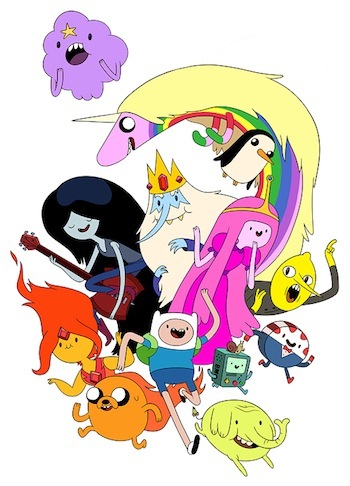 With an 8-year run, Adventure Time is the fourth longest-running series on Cartoon Network, surpassed only by Ed Edd 'n Eddynote in terms of years on-air (10 years), The Powerpuff Girls franchisenote in terms of years on-air (12 years), and the collective Ben 10 franchisenote in terms of years on-air (13 years). It has also 283 produced episodes which makes the series the second most number of episodes on all Cartoon Network series, the first being Ben 10 franchisenote in terms of number of produced episodes (390+). Combine that with the amount of merchandise and other media spinoffs the work has garnered, it's probably fair to describe Adventure Time as one of Cartoon Network's great success stories. The Recap page is in need of more love. The Crowners for Best Episode and Biggest Complaint.